Sometimes I’m surprised what dogs can eat – ranging from eating cat food, human food, raw vegetables and so on. Unfortunately, dogs have a reputation also for eating poop. Let’s face it, a dog at least few times in its life have tried to eat feces. Maybe it was as a puppy or sometimes even as an adult dog, but that’s what they do. Reasons for dogs feasting with the content of litter box can be various. Dogs like to have their home clean, so if a litter box is near by, they won’t hesitate. Same as human babies want to taste everything, puppies love to explore the world around them and try different new things. Does your dog really like the taste of cat feces? In fact, they might as cat food contains a lot more protein than dog food does, therefore, even a poop might seem like a good snack for your barking friend. In this article, we will explain how to stop your dog from visiting cat litter box and eating cat feces. At first, this might seem strange and disgusting. Why doesn’t my dog understand that it is a poop and it’s not made for eating. The real answer is: they do so because it tastes good. Cats, as well as other animals, may not process and digest their food properly leaving some valuable nutrition (dogs are mostly after protein). Eating poop is very common in puppies but as the dog gets more mature, it loses this nasty habit. Can it harm my dog? In most cases – no. Your dog will be just fine if it has eaten cat feces. In the worst case, this can result in vomiting and diarrhea. There shouldn’t be any serious health concerns. Just make sure your cat has had worming medicine and has no internal parasites. However, if cat feces doesn’t hurt your companion, you shouldn’t think it’s fine for your dog to snack once in a while. If this happens on daily basis, there definitely needs something to be done. First of all, owners find it very disgusting. Dog’s breath isn’t the most fragrant by its own, even more, if it eats cat poop. You sure don’t want your dog to lick you after having this kind of feast. Mostly all dog owners who face this issue want to fix it as it’s just disgusting. There are many ways how to do this starting from placing cat litter box in the area that your dog can’t access up to training your companion not to eat what isn’t allowed. HM tip: Before performing anything, think a while if it affects your cat. For example, will your cat be able to access its litter box? Cat doesn’t have to suffer from your dog’s nasty habits. Keep your cat’s litter box as clean as possible. If the litter box won’t contain any feces, there simply won’t be anything your dog could eat. Most cat owners scoop their boxes once a day. I bet living with your cat day by day you know it’s daily rhythm. Scoop as often as you can. When leaving, block your dog from accessing litter box. Train your dog not to eat what’s not allowed. 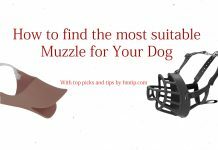 If you have time to devote training your dog, this is the best option as you won’t have to change anything in your daily rhythm and cat litter box location. To do so you will have to watch your dog and whenever it wants to visit litter box, call him and say no. If he obeys you, give him a treat. A proper dog treat should look more appealing in your dog eyes than cat feces. Over time and with some patience, your dog won’t visit cat litter box anymore. Make your dog busy doing other stuff. If your companion is bored, naturally it will look for things to do including visiting cat litter box. To prevent this you can get your dog an interactive dog toy or spend some time playing with it yourself. Make sure there are enough physical activities. The busier your dog will be, the less often it will visit cat litter box. Place litter box there, where the dog can’t access it. Cats are natural climbers and jumpers. They can access the highest shelf with ease when your dog can only dream about it. However, this doesn’t mean you have to place your cat’s litter box somewhere extremely high. Just place it on an elevated surface. Overall we don’t recommend this as its impractical and your cat might not like it. However, we have heard reports that small elevation helped. Using a covered litter box. A great solution is using a litter box with a cover. It’s great especially if your dog is larger than your cat. If not, this probably won’t be so effective. One thing you have to keep in mind that cat might not be accustomed to a closed litter box at the start. The most sensible choice is limiting your dog’s access to cat litter box. For an example, you can use cat door or a baby gate. 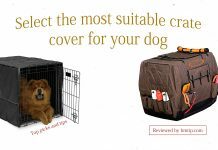 Your dog won’t be able to get past it (small dogs might manage to). When you are leaving your home you can separate your pets. Combine this with regularly cleaning cat litter box and this issue should be solved.